Fish sauce is considered essential in Cambodian cuisine, Filipino cuisine, Thai cuisine and Vietnamese cuisine. There are many varieties, all made from fermented fish or shellfish, but some are made from raw fish whereas others are made from dried fish. As well as fermented fish, fish sauces also contain a selection of herbs and spices. Lucky Brand Thai Fish Sauce 23 Fl. oz. Ingredients: Anchovy Extract, Salt, Sugar, Water. This superb sauce is prepared in hygienic and modern process. Simply add a few drops to all dishes instantly improve the flavor of good foods. Ideal for all seasoning purposes. Red Boat premium fish sauce is a secret ingredient used by professional chefs and home cooks around the world. 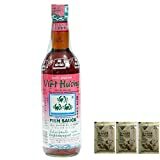 A national treasure of Vietnam, Red Boat is made using traditional chemical-free fermentation methods, a unique two hundred year-old artisanal process using only the freshest ca com (black anchovy), salted minutes after leaving the sea then aged for over a year in traditional wooden barrels. Red Boat anchovies are sourced exclusively from the crystal clear waters off the Phu Quoc island archipelago. Red Boat is pure, 100% all natural first press "extra virgin" Vietnamese fish sauce. made form only two ingredients it is free from added water, MSG and preservatives. The quality of fish sauce is determined by protein levels. no other fish sauce has a natural protein content higher than Red Boat 40 N. Packed with B vitamins and minerals, the extra-rich protein content gives Red Boat a unique character and savory flavor that is healthy and delicious. Red Boat fish sauce gives all of your favorite recipes that elusive fifth flavor - umami. Try it with all things Asian, Caesar salad, pasta, braised dishes, or any seafood based recipe. Red Boat is an all-natural, first press, "extra virgin" Vietnamese fish sauce. It does not contain added water, preservatives or MSG. Made from a 200 year-old, chemical free, artisanal process, Red Boat uses only the freshest CA com (black anchovy), salted minutes after leaving the sea then slow aged for over a year in traditional wooden barrels. Red Boat anchovies are sourced exclusively from the crystal clear waters off the Phi Quoi Island archipelago. Includes one bottle of 8.45 ounce (250ml). This fish sauce has a nice overall flavor and very attractive light golden color. The quality is very good; it's made in a traditional process and is considered a gourmet fish sauce. This fish sauce is not strong-smelling and it's slightly sweet, a little bitter. This professional product used by many top chefs across US. Red Boat "nuoc mam nhi" is the secret ingredient in South East Asian cooking. The savory, sweet, and umami-laden sauce gives dishes a unique, rich and satisfying dimension. Red Boat is an all-natural, first press, "extra virgin" Vietnamese fish sauce. It does not contain added water, preservatives or MSG. Made from a two hundred year-old, chemical free, artisanal process, Red Boat uses only the freshest cá com (black anchovy), salted minutes after leaving the sea then slow aged for over a year in traditional wooden barrels. Red Boat anchovies are sourced exclusively from the crystal clear waters off the Phu Quoc Island archipelago. Whether you are a master chef or enthusiastic home cook, we guarantee you the highest quality product and the best results. Fish sauce provides the essential savory flavor found in traditional Thai cuisine. Our Premium Fish Sauce is made only from the careful first pressing of salted anchovies. Its complex flavor blends smoothly with the sweet, tangy and spicy flavors of Thai cuisine. Use in place of soy sauce or salt to add a savory taste to any dish. Ingredients: Anchovy extract, salt, water, fructose & Hydrolysed Vegetable protein.